This week, there were six of us and I was keen to try out my Secret Santa gift, Jamaica. This is a sort-of race game with treasure and piracy thrown in, where your score is determined by how close to the finish line you are when somebody crosses the finish line, how many doubloons you have in your hold, and the value of treasure and curses you have amassed. Now Mark W seemed to have great difficulty leaving port. As soon as he left, he kept finding he didn’t have the food to pay to stay at his destination so kept moving back. Once he did get going, I started to try moving backwards to keep out of the way of the others as my hold had been filled to the brim with doubloons. Plus I had some supposedly secret treasure – well it would have been if Mark K hadn’t faked a slip of the tongue and warned everyone of its value so they didn’t cross the line too early. Mark G ended up across the line first and had just enough in treasure and doubloons to overtake my total. This was a pretty fun game and the combat kept things interesting, although my lagging back and others trying to wait for me added a bit to the game length. However, it was still a good game that would play well with the family. Our next game was my Game of the Month for December but it was the first time we had played it at the club. The Resistance is a social deduction game where, with six players, the four resistance operatives are trying to successfully complete three out of five missions while two spies are trying to sabotage those missions. Each mission starts with someone proposing who should be on the mission team and then everyone voting whether or not to agree to that team. If the team gets voted down, the next person gets to propose a team until a majority of players votes in favour of a particular team. Once the team has been established, each team member secretly plays a card for the mission to succeed or fail, with a single fail card meaning the mission is unsuccessful. Once three missions have succeeded or three failed, the game ends with a win for either all resistance players or for all spies.Our next game was my Game of the Month for December but it was the first time we had played it at the club. 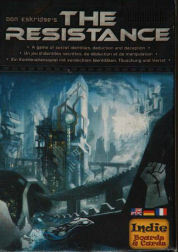 The Resistance is a social deduction game where, with six players, the four resistance operatives are trying to successfully complete three out of five missions while two spies are trying to sabotage those missions. Each mission starts with someone proposing who should be on the mission team and then everyone voting whether or not to agree to that team. If the team gets voted down, the next person gets to propose a team until a majority of players votes in favour of a particular team. Once the team has been established, each team member secretly plays a card for the mission to succeed or fail, with a single fail card meaning the mission is unsuccessful. Once three missions have succeeded or three failed, the game ends with a win for either all resistance players or for all spies. The game came down to the very last mission and after a couple of mission teams had been proposed and declined, it was down to me to choose a team. Now, it has to be said that Mark W had appeared to be somewhat confused all the way through the game and had voted against the successful mission team in the fourth round. So when I proposed a dream team of myself and the three Marks, Nige was quick to point this out to me. However, after careful reflection, I explained that a strong team not only needed brains, quick wits and brawn but also the token bone-head and continued with my original proposal – mainly because I was confident of having worked out that Nige was a spy on the third round. And so it was that the mission was successful and the resistance triumphed. I really like this game and Nige seemed equally impressed. It plays with between five and ten players and I’m sure the game will work differently with different numbers of players. However, it won’t suit everyone and Guy rated it quite low as it wasn’t his kind of game. With about half an hour left, we decided to finish off with another game of The Resistance – unusual for us to play a game twice in a row. However, this time, it didn’t turn out quite as well for the good guys. The first mission team of Mark W and Mark G came through with flying colours, although Mark G had been rather too hesitant in picking his Succeed/Fail card and suspicion immediately fell on him. After the spies had managed to sabotage both missions two and three, it suddenly became very tense. Again a couple of mission teams got voted down and I was again the proposer. Now, I was pretty sure that the spies were Mark G and Nige but I wasn’t discounting Guy so even though I put forward Mark K, Mark W, Guy and myself, I did have a slight doubt. The mission team got approved and off they went….and it failed! Disaster but even moreso as Mark W turned out to be the second spy. Mark K and I had assumed it was Nige and Nige had assumed it was me. It was very well played by the spies especially with proposing themselves on the first mission and both voting it to succeed. So, Mark W turned out not to be such a bone-head second time around. Excellent stuff. Board game for 2-4 players, ages 10+, approx playing time 45 minutes. Published by Z-Man Games, designed by Corne van Moorsel. However, it sounds as though stock will be very limited as most of the allocation to the UK was covered in mold. Oops! Paul Allwood emailed me yesterday to let me know about his UK game group. Newcastle Gamers are an established group playing Euro games, Board games, Wargames and Card games across the North East of England. According to their website blurb,Â they are a very friendly club of mixed ages, mixed experience and mixed interests butÂ they come together twice a month to shareÂ their common passion for gaming. A large selection of games is always on offer, but people are also welcome to bringÂ their own. They have just, as of 29th January 2011, changed venue andÂ now meet at Joseph Cowan House [NE2 1QQ], 21 Portland Terrace in Jesmond, Newcastle. Portland Terrace connects Sandyford Road and Jesmond Road and is very close to Newcastle city centre. All the details about the club are here. Now that Boardgamenews has been assimilated by the Borg that is Boardgamegeek, some of the former contributors have got together under resistance leader, Dale Yu, to launch a new blog covering game reviews and columns about gaming i.e. the non-news bits of Boardgamenews. They comprise a veritable “slew” of talented writers and I’m sure there’s going to be some great reading to digest there …. and the odd Ted Alspach comic strip as well!!!! I’m looking forward to seeing how this develops and you can following along here. Board game for 2-4 players, ages 13+, approx playing time 180 minutes. Published by White Goblin Games/Z-Man Games, designed by Kasper Aagaard and Christian Marcussen. Board game for 2-5 players, ages 10+, approx playing time 45 minutes. Published by Sirius Games/Mayfair Games, designed by Frederic Moyersoen. Board game for 3-6 players ages 12+, approx playing time 120 mins. Published by Valley Games, designed by Martin Wallace. Tile laying game for 2-4 players ages 10+, approx playing time 45 mins. Published by Valley Games, designed by Tyler Sigman. Only a handful of articles so far but some interesting stuff. You can view the site here. Woo hoo! My Secret Santa emailed me a couple of days ago to let me know that real life got in the way of him sending something before Christmas but something was on its way. And voila! 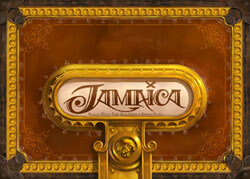 A parcel arrived today with a shiny new copy of Jamaica – a great choice of game and one I can’t wait to try out. Many thanks Santa! This week we were all lined up for a four player game of Opera when Mark G arrived to give us five players. 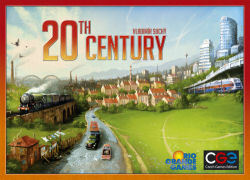 Once Opera waspacked away again, we opted for 20th Century, the new game from Shipyard designer, Vladimir Suchy. This was an interesting game of trying to balance coin and science production (the two currencies for the two types of auction in the game) with garbage disposal and victory point production. Not knowing the land tile distribution (or more specifically the recycling plant distribution) for our first game, most of us started off pretty conservatively, except for Mark K who bought four land tiles on the first turn with the asociated 10 garbage tokens. For a while, it wasn’t looking too promising for him but he did eventually manage to acquire the necessary recycling plants to get rid of his waste, although we were very kind to him in allowing him to acquire the right tiles without overpaying – I think we were all too concerned with our own garbage and pollution. Nige and I were pretty starved of science points so we were resigned to taking the worst catastrophes while Mark G steadily built up an impressive ‘green’ economy and scored loads in the final bonuses. However, Mark K ended up in a different league as he cleared all his garbage and also scored lots of points at the end to add to an already sizeable lead built up during the rest of the game. We all enjoyed this and will probably have a better idea of how adventurous to be, now knowing that recycling becomes more common as the game progresses. Good stuff and a good win for Mark K.
Scores and ratings are up on my Trickylight site. Shifnal Village Hall will accommodate up to 120 people, and you should contact telfordminiconÂ to reserve a space. Cost of entry will be Â£5 which also gets you a free ticket for a prize draw, included will be a unique prize that money can’t buy. The final Spielbox of 2010 arrived today and includes a “Christmas Tree” expansion for Zooloretto. The bad news is that the instructions say this can only be played at Christmas so it looks like I’ve missed out for nearly 12 months; the good news, however, is that there is a note at the back of the issue that readers of the international version of the magazine are exempt from this restriction. Phew! (Actually, I’m unlikely to play it anyway, but you never know). The bulk of this issue is devoted to a report about the Essen releases although there are also a few detailed reviews, including Asara, The Pillars of the Earth Card Game, K2, Thunderstone and Safranito. The Ted Alspach game, Perpetual Motion Machine (which is a neat little card game that I played and enjoyed with Bex before Christmas) also gets a thumbs-up in the At A Glance section.